Today, Lord Dennis Stevenson and Paul Farmer, CEO of Mind, published their independent review, Thriving at Work, into how employers can better support all individuals currently in employment, including those with mental ill health or poor well-being, to thrive at work. This work was commissioned by the Prime Minister in January. This is an important review and its implementation could provide significant benefits both to employee health and the economy. The key recommendation is that all employers, regardless of size or industry, should adopt six ‘mental health core standards’ that lay the basic foundations for an approach to workplace mental health. The review also recommends that large employers and the public sector go even further. Acknowledging our role as the third largest employer in the public sector, Thriving at Work makes specific recommendations for the Civil Service. 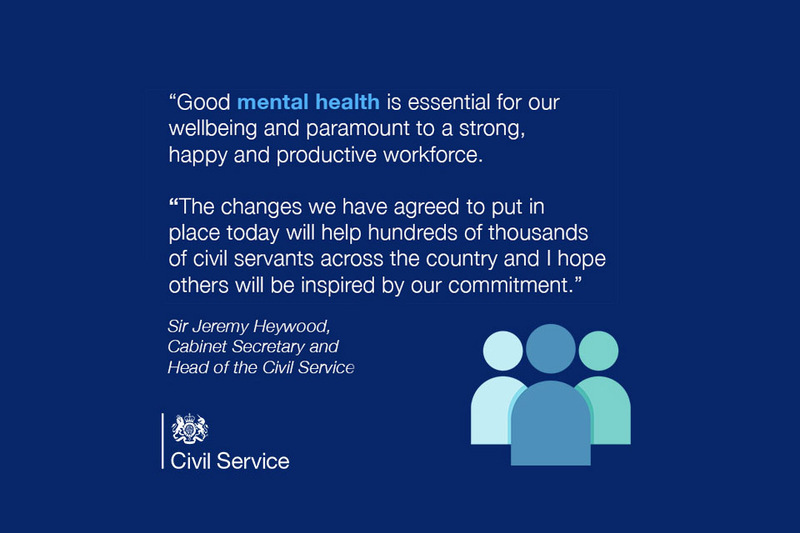 The mental health and wellbeing of all civil servants is a key priority for me and the Civil Service and the review acknowledges the progress we have already made on the Disability and Health and Wellbeing strategic priorities, superbly led by Philip Rutnam and Jonathan Jones, our respective Champions. However, the findings of the review mean that we can now benchmark our performance and identify those areas where we can go further. We’ve already made a good start on raising awareness about and supporting the mental health of civil servants. Mental Health First Aiders are in place across the Civil Service, equipped with guidance on how best to support the mental health of other civil servants. This includes learning frameworks, examples of best practice and cross-government workshops. We’ve also launched a ‘talking about mental health’ role-model campaign for the Civil Service to encourage an open dialogue to reduce the stigma often associated with mental ill health. Posters around government buildings feature civil servants from across departments who volunteered to share candidly their own mental health stories. We will also ensure appropriate adjustments are provided to our staff and that both visible and non-visible disabilities, such as mental health, are treated equally. With this in place, we will enhance the Workplace Adjustment Passport, which records agreed workplace adjustments to help employees move jobs within the Civil Service. Our Government Chief People Officer, Rupert McNeil, has shared stories of Ian, Lisa, Lynsey, and his own about how the Workplace Adjustment Passport has helped them. Additionally, we’re developing a Wellbeing Confident Leaders Programme to equip leaders to manage their own wellbeing, that of their teams and their organisation overall, to embed culture change in strategic and organisational decision-making. The Civil Service is committed to being a leading employer on mental health support, which is why we have already accepted the recommendations of today’s review that apply to us. Providing effective mental health support is a critical part of meeting our ambition to be the UK’s most inclusive employer by 2020, as set out in the Civil Service Diversity & Inclusion Strategy we published earlier this month. Departments will therefore benchmark themselves to see how their support for employees currently measures up to the recommendations set out in the review. This will help departments to identify areas where they are performing well and those areas where they need to take additional action. The breadth of job roles in the Civil Service is wide ranging and we recognise that some roles may be at higher risk of stress and trauma due to the nature of the work involved. Departments already provide additional support packages to anyone working in these roles, but they will be looking to see what more they can do as well as sharing best practice to create a framework that can be used across the Civil Service. Early next year we will launch a Mental Health and Wellbeing Confident leadership programme. If we are to achieve the cultural change needed, it’s vital that leaders role model behaviours that reflect awareness of their own mental wellbeing, and that of their teams. Civil Service HR will also review and enhance the wider suite of mental health training and work with departments to ensure employees receive training appropriate to their roles. We’ll be updating on these actions in the months ahead. In the meantime, I encourage all civil servants to join the debate on mental health support that has been raised by the review. Through openness we can break the stigma that surrounds mental ill health and create a culture in which everyone feels able to talk and to access the support they need. Can I recommend the Blurt Foundation website to all my colleagues. Not only does it offer fabulous support to those unwell because of their mental health; it also offers support and strategies for people supporting friends, family or colleagues through difficult times. I'm really excited about this report, and the importance it highlights of drawing on staff networks in the workplace. I'm confident that the Cross-Government Mental Health Network can play an important part in working towards implementing these recommendations in the Civil Service and wider UK government bodies. A great step forward. I promote mental health awareness through presentations in the work place. I have used running as a vehicle to curb my own issues with mental health. I have since rebuilt my life and ran some of the toughest footraces in the world. But what I learnt about myself in this process has really helped me cope. I would love to do it across the Civil Service. If you need my help let me know. I am hoping to do something similar to this in my office, promoting awareness through presentations. I was wondering if I could speak to you further about this and share some ideas. If you are interested, would you mind replying. I also promote mental health awareness in the workplace. I was trained by Time to Change Wales to be a 'champion'. Time to Change does the same job in England. This is good news, but still a long way to go. I am a qualified Mental Health First Aider and a Counsellor. Improving Mental Health in the workplace and increasing access to help at work is something that I am passionate about. My volunteer work at MIND gives me knowledge to help supporting Mental Health and Wellbeing in the Civil Service, but I am unable to make the contributions that I would like to the Civil Service locally where I work, due to lack of support from Management. I would like to work outside of my office and higher up in the Civil Service to help to make a difference. Many thanks. This looks to be a good way ahead and one I hope is fully followed through. It is all very well giving me the tools to deal with issues and cope better with stress, however what is always missing is what my employer intends to do to alleviate my stress:- do they look at workloads -No, do they look at staffing levels- eh, No - they just keep piling it on. I therefore hope that the message gets through to managers in the Civil Service and indeed politicians , that good mental health is a two way street, simply by saying "you have been on a course, you should know how to deal with that" isn't good enough. As part of learning at work week, I am delivering 3 workshops to colleagues in my office. The approach I use has had a massive impact in both my own life, having suffered from depression and anxiety issues, and the lives of my clients. I have my own business outside of HMRC as a transformative coach. My qualifications include diploma in hypnotherapy, emotional freedom technique practitioner and neuro-linguistic programming practitioner. I'm looking so forward to sharing this with people in order to enable them to find their own answers to the challenges they face. It's great to see that mental health is being give top priority by HMRC. I'd love to see large-scale change in this important area. Perhaps finally mental health is to be treated on a par with physical health - a promise often made and never delivered. With this history I'm not holding my breath. Good to see the issue of "fit notes" being raised, in my experience GPs are reluctant to use these to their full potential; often simply completed with the "Unfit for work" box ticked and diagnosis, no notes to support potential capability and/or a phased return to employment. What is vital that it has to be a joined up approach across all sectors, fully resourced and enthusiatically supported from top to bottom. Simply placing an objective with senior leaders without effective sanction if not achieved (how will this be measured? From the results of a yearly staff survey?) can and often does become a box ticking exercise. An excellent report with some rightfully ambitious, though totally achievable, recommendations. Over to the mover and shakers to make it all happen! ACCESS to mental health support in the civil service is one of the main barriers I have struggled to get through. There are so many intranet pages telling us how we are "committed" to helping and how we are proud to "support" staff with mental health issues, but it is hard to find clear access to these support structures. Unless you are lucky enough to have a line manager who supports you (and believes in mental health issues!) but also who has the time and knowledge to help point you in the right direction, it's quite frustrating to read so much commentary without being able to find a way to access real help. CBell: 100% agree. Fighting a battle year after year with my disability against my local management has had the word 'depression' entered alongside my name with 'stress' already being there for a long long time. I need the support from one of the outlets who beat their drums yet a request to Wellness came to nothing. A request to Access to Work came to nothing. A request to the Disability Network was not answered, I could go on. So just where do you go. Contacts are made, then broken or not replied to while policy makers say "We will be the best" well there is a hell of a long way to go yet. One problem now, which I have posted on another blog, is that there is no longer the option for the line manager to 'support' an absence. This means many people with mental health problems who might need to take the occasional day off sick will end up on a performance improvement process for going over the number of sick days they are allowed to take. This will place many people under a lot of stress and exacerbate their condition. This can't be right when the CS says it wants to support people with mental health problems. Can this be addressed? It is a huge issue. This is because the Civil Service not only doesn't take mental health issues of its staff seriously, but is often the root cause of it with bullying managers and poor systems (IT, room booking) which prevents people from carrying out their tasks effectively and then blames them for it. Well said Russell. There are too many lower, local managers with a small but fully supportive network of above them and below them line managers who bully and harass. They have done this for years so it is part of their natural thinking and 'nobody can touch me/us.' These are the people that the top line managers need to seek out and get rid of. They might even find a bit of an uplift in the Staff Survey then, a pay rise would help too. I wish I could find out who in the Civil Service will actually take responsibility for the massive and chronic problem of bullying. I’ve been asking for three years, and no progress, I just get told it’s not covered by the CS principles (it should be), and that there is a hge initiative to deal wiht it. So, how can I get in touch wiht the people who need to know about the evidence of bullying, intimidation, persecution and harassment? I have suffered victimisation but those that victimsed me were the same people who were then tasked to investigate it, so guess what? Yes, they found there was no bullying! How convenient. In the REAL WORLD, if you complain about beng bullied, you are accused of bullying yourself and of poor performance then you are undermined when you are off sick with stress. Welcome to the Civil Service. What needs to happen is to tackle the root causes of mental health problems. For too long, senior leaders have ignored the continual bullying of staff by toxic people who are not capable of managing staff and should be either demoted or dismissed. Also, all departments should get rid of this appalling performance management system which only adds to stress and does not work, as has been proved in the private sector. Well this is good news and I'm glad that that this topic is finally being highlighted. However, the root causes for the majority of peoples' stress leading to physical and/or mental ill-health is not going to be addressed by this, you need end the pay cap, recruit more staff and treat people well, none of which dealt with in the article. Senior managers need training how to manage mental helath. My Dept has caused my depression, but then blames me for the negtive impact of their bullying and the depression it caused as inappropriate behaviour by me. And then decided that I'm bullying them. And that 'we are not here to manage your health'. Maybe you aren't technically, but a little support and understanding when I have a wobble that they triggered wouldn't go a miss rather than the get over it and move on attitude that prevails. Whilst they are correct that the department is not there to 'manage your health', it does have a duty of care over you and should not be the cause of your depression. This is a start. Mental Health issues finally being recognised as being a genuine health issue, However, Managers are not trained Counsellors and should not be expected to provide Mental Health advice. Give Managers recognised external training from a recognised Mental Health training provider. All managers want to help and support staff, but feel under qualified and tend to be wary of giving advice in case it is incorrect and exacerbates the situation. Give managers the tools to care for their staff professionally and knowledgably. This would be wonderfull if actually practised in the work place but i do not think that will ever happen! Staff being scared to have time off ill even if there mental health has been classed as a disbuility. Unless thinks really really change with policys and training across the whole civil service it is just a blanket cover up that things will change. Actual work and support needs to be injected which unfortunatly will cost money.....money that the civil service has not got and wont spend on staff wellbeing. This is speaking from an employee of 15 years which has suffered from mental health - even to having a breakdown in work. leaving work and contemplated jumping off the nearest bridge. Being forced to use holidays for a week with no other support apart from see your doctor. Remember your not allowed any time off sick or you will get a warning if its over a week and a half. Please actually help staff with mental health difficulties as we are much more productive with help and support. The mental health first aiders program seems to have been stopped in the line of business which i work in the DWP. The department is committed to creating an environment where mental health can be discussed honestly, openly and without fear of judgment or discrimination. The department has prioritised supporting mental health first aiders, whose role is to act as an initial contact point for individuals experiencing mental ill health, signposting them to appropriate professional support. There are already 190 across the department, and plans are underway to train even more over the coming months. We are currently looking at a communications plan to enable members of staff to contact a mental health first aider from any part of the department. Supporting those with mental ill health and their line managers by providing learning opportunities to improve awareness and understanding is a key priority for the department. DWP has been a member of the Mindful Employer scheme since 2010. This provides the department with access to information and support allowing us to recruit and retain staff who experience mental ill health. We have a mental health learning and support route way on our intranet page providing a wealth of information for staff and line managers including several training courses that can be undertaken via our employee assistance provide HELP EAP and Civil Service Learning. My management stated we are not psychiatrists', and another threatened me with a letter stating I should resign, whilst I was having panic attacks at home. So mental wellbeing is not being supported. This is all and well in writing but this needs to be implemented by managers and HMRC needs to put it in practice, because currently disabled workers are being very badly discriminated against. Having your manager on your back all the time just makes your mental condition even worse and if you go off sick them that's more stress as you are then put on a written warning. Its a vicious cycle by HMRC. My recent personal experience of depression and anxiety was to have excellent help from my GP, family and friends. Sadly my HMRC manager wanted to hold my formal attendance meeting in a supermarket café, although I wasn’t told it was a formal meeting but a quick catch-up. My PMR also reflects my depression and anxiety so forgive me if I am cynical. It is important to remember that poor mental health is an illness as is any other. It may not be physically visible, but that does not mean it isn't there. My own experiences have been very positive, I have been very well supported by work and my colleagues as well as having invaluable help from the medical profession. My main point to get across is this, there is always help available - please don't be afraid to ask. I acknowledge and welcome this commitment from the top. There is still an enormous amount of education to be carried out throughout all departments - and more-so in recruitment. I have been working in and accross a number of staff and TU networks to promote awareness of - in my case Autism. Much has been included in the new Civil Service Diversity & Inclusion Strategy to acknowledge the work of such networks and to some extent - give the business case for such work to be part of the business. Recruitment remains a problem. My literal Interpretation Autism - for example - means that I use extra words for clarity. The 250 word limit for competency statements will never work for me. I have an agreed adjustment of an extra 100 words - which is useful - but on more than 20 occasions - this has been overlooked and I have been sifted out of interviews. This has been happening for two years - and is still happening - as of this week. I flag it up with the vacancy holders - sometimes I get no response - sometimes they apologise and ask me to resubmit. Re-submitting with a view to getting some one to change their decision is not a good starting point. Despite the leadership principle of welcoming change - mo matter how uncomfortable - managers and leaders do not welcome change. Similarly the leadership principle of giving open, honest and constructive feedback is somehow lost in recruitment - as the practice and custom (if not the policy) - is not to give feedback in the recruitment process to those who do not get invited to interview. This is at odds with good practice advice in the Mental Health First Aid England managers handbook. Simlarly - deciding on a GIS candidates suitability for a post - based on one 250 word statement against a competency - rather than looking at the whole person - and what they could offer with a reasonable adjustment - is quite discriminatory.